We've been eager to hear when the sixth and final season of Netflix's hit political drama House of Cards would debut. Finally, we've received an official confirmation of the premiere date as well as who will be leading the series, and we'll give you a hint: it definitely isn't Kevin Spacey. During the 2018 Oscars, a teaser trailer aired confirming that the latest season would be coming this Fall, and on Aug. 7 a brand new poster featuring leading lady Robin Wright revealed that the series will return on Nov. 2. That's not too far of a wait, right? If you still find yourself longing for a first look at the new political figures played by Greg Kinnear and Diane Lane, there are a few things House of Cards fans should check out in the meantime. 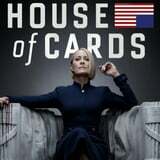 For starters, watch the nail-biting trailer for a closer look into the final season, spearheaded by the powerful girl boss Claire Underwood (Wright). Could there be a female-fueled spinoff in the works? We can hope, but we'll have to stay tuned to find out.